Alera Labs operates a modern analytical laboratory providing custom services to its clients, including but not limited to characterization and certification of client materials, material stability studies, method development and validation, impurity studies, structure elucidation, and method transfer. With hundreds of methods developed, validated and/or transferred, Alera Labs’ team consists of highly skilled analytical chemists talented in developing and validating phase appropriate methods. Once we develop a method, we can assist with method validation and transfer to a third party or to the client’s laboratory. We will provide necessary guidance on the validation experiments required in compliance with cGMP. Alera Labs offers comprehensive impurities testing for both small and large molecule drug products or APIs. We can perform forced degradation studies, which will provide an insight into potential degradation pathways and their potential impact on pharmaceutical development. Degrading related impurities can be characterized or identified by performing degradation studies under acidic, basic, oxidative, and various heat and light conditions. 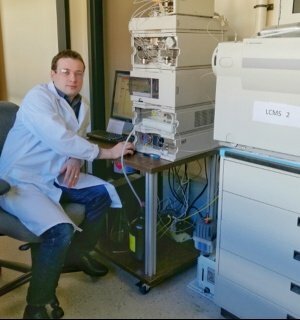 If you have a drug product or API that exhibits peaks in chromatograms that you would like to identify, we will assist with structure elucidation using LC-MS technique. Such studies are usually required during pre-clinical and early clinical stages. Major degradation products also need to be identified during forced degradation studies. Your program will benefit tremendously from optimization of absorption, distribution, metabolism, excretion, and toxicity properties (ADME/Tox) of your compounds in addition to pharmacology (efficacy and selectivity). We will also gladly perform fast and efficient sample analysis either using a method provided by the client or developed by us. If you are in need of a challenging method development, you’ve come to the right place. Our scientists have expertise with virtually all possible classes of compounds and can find solutions to most difficult separations. Whether you are looking to quantitate a low level active compound with no UV chromophore or a highly labile compound, we can help solve your problem. Ask us about validated, reliable biomarkers that can be used in your project. We can provide free analysis of markers appropriate for your pathway or set up quantitative assays for your marker of interest. Screen compound or protein adsorption and stability following filtration at lab scale.